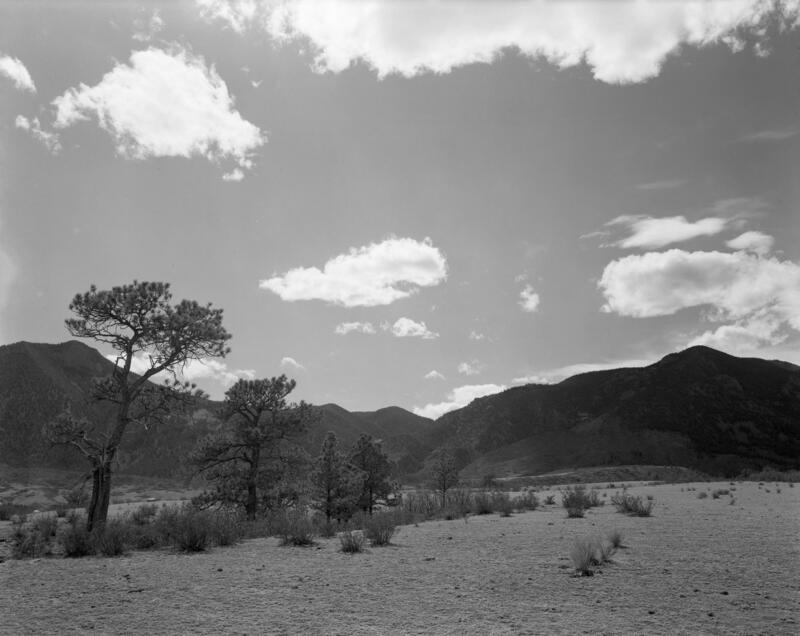 Ansel Adams photographs were taken April 1955, one month prior to the initial design presentation/exhibit at the Colorado Springs Fine Arts Center on Mary 14-15, 1955. 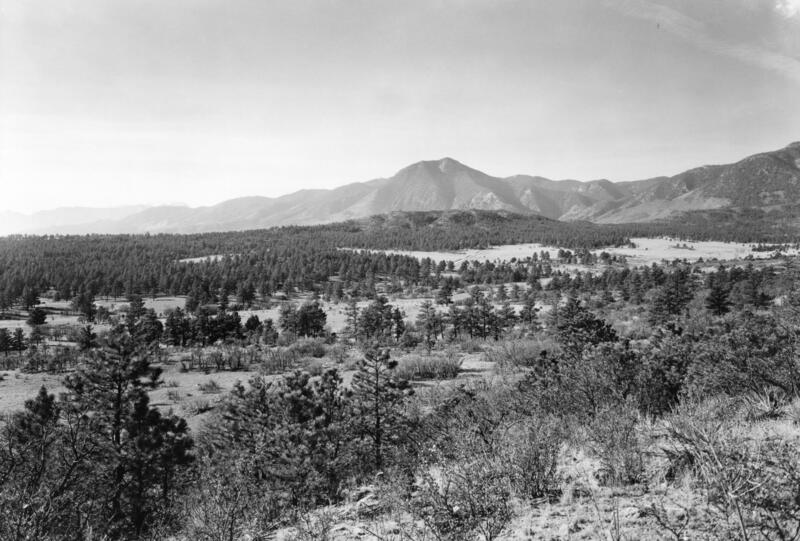 In the 1950s that was just north of Colorado Springs. Eric Keune says Ansel Adams entered the picture for the Air Force Academy in an interesting way. Keune is design director for the Chicago office of Skidmore, Owings and Merrill- the firm that designed the entire Academy campus. For Architect Walter Netsch of SOM, that meant moving to the location before any sketches were made. “He and his colleagues would hike all over the site and it was instrumental, specifically in this case, in understanding the unique topography of the site and where all of these different programs could best fit on such a steeply sloping mountainous site,” Keune says. Netsch and his team had a very limited amount of time to design the campus. He wanted there to be a close relationship between man and nature on 18,500 acres making up the Academy. Ansel Adams and another photographer were commissioned to take very specific and very large format landscape photographs only of the site, according to Keune. 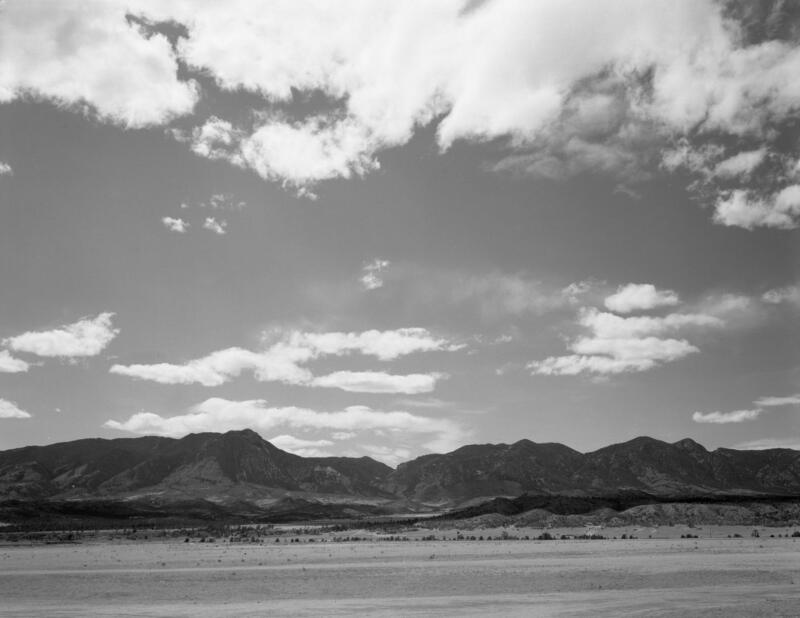 The grayscale photos were taken more or less from eye-level, from the lower portions of the Air Force Academy site, looking up at the mountains. In one, a small farm is visible. Another shows the location in relation to Pikes Peak. “A second photographer took aerial views looking down onto the site from above,” Keune says. 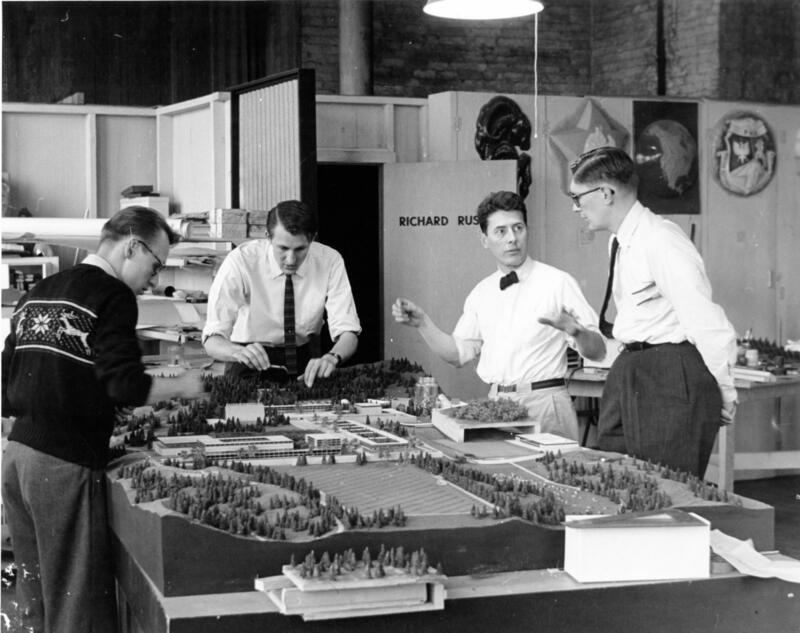 The photographs were blown up to wall-size and used as a backdrop for a large-scale site model, prior to any construction. “So, people would perceive the site model almost as though it were in the context of a landscape itself,” Keune says. Exhibition at the Colorado Springs Fine Arts Center, May 13-15, 1955. It was common practice in the 1950s to present projects deemed of great importance to the public through an elaborate exhibition in an art museum. For the Air Force Academy, that was the Colorado Springs Fine Arts Center, where the photos and the model were showcased. ”The exhibition itself was designed by a famous Bauhaus instructor and exhibition designer from Europe,” Keune says. Bauhaus is a German art and design school considered to be the most influential of the 20th century. 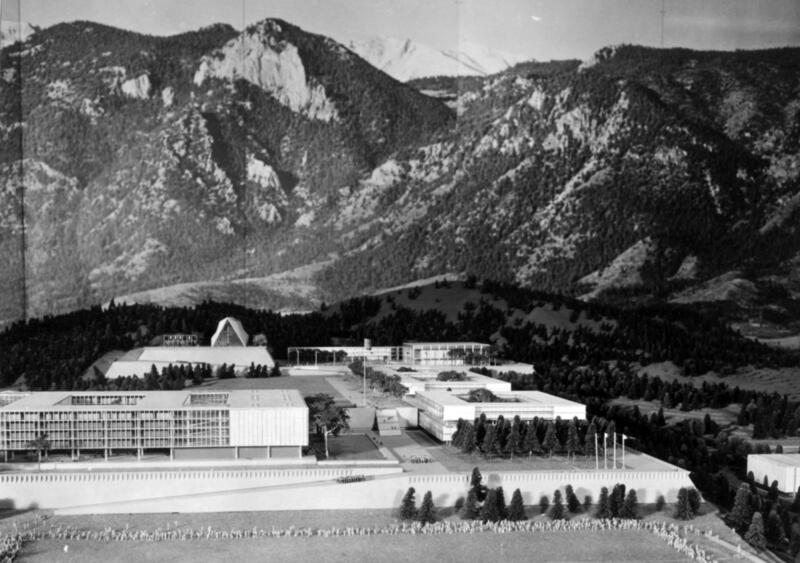 Its teachings shaped modernism all over Europe and, eventually, the world—including the United States Air Force Academy. Rumor has it that Adams was paid just $1000. Neither the Academy nor SOM could confirm that, though. 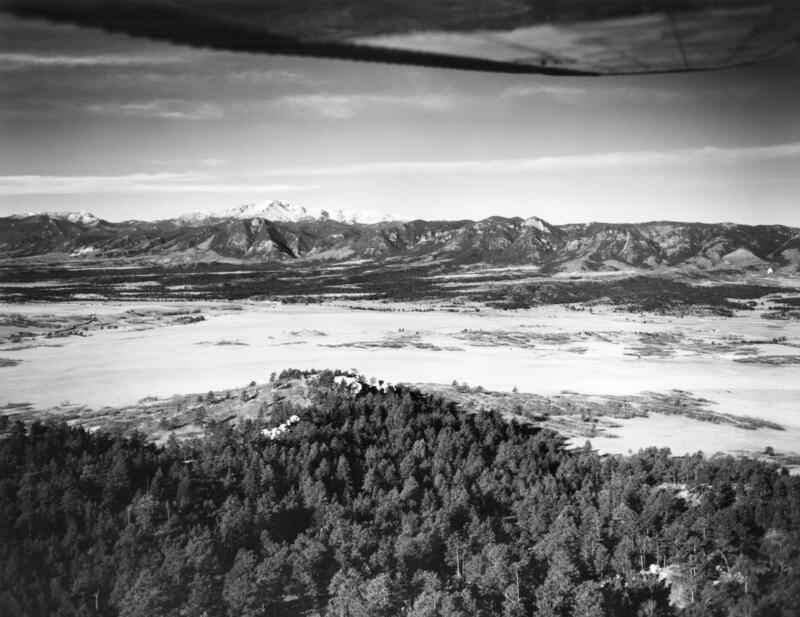 SOM retains the rights to Ansel Adams’ negatives from the Air Force Academy project. They’re stored in a central repository of records, much like the firm’s records of the One Trade Center in Lower Manhattan, or the Burj Khalifa in Dubai, or even Picasso's renditions of sculpture for the Chicago Civic Center in the 1960s. Although Keune has never been to the warehouse, he says he pictures it like a scene from a movie. “I imagine it is like the Raiders of The Lost Ark warehouse—just an endless gigantic space covered with boxes as far as the eye can see. Maybe it doesn't actually look like that…” he laughs. While largely unknown, the negatives were never lost, Keune says. More like in good company in that warehouse filled with plans, sketches and notations that would make any art historian weak at the knees. “Those pieces that are constantly being asked for by various historians or researchers are kept actually here in the building, in our basement, but where exactly those Ansel Adams negatives were, I could not say,” he explains. “I would guess that they were probably in that Raiders of The Lost Ark warehouse." The photos were published in a book in 2004, and a few are hung up in the Academy’s library. The project as a whole is one that Keune says SOM is proud of. A cultural history and landscape many on the Front Range drive by daily—all of which came to life with the help of Ansel Adams. Editor's Note: The Fine Arts Center is operated by Colorado College which is 91.5 KRCC's licensee. The Cadet Chapel at the United States Air Force Academy has a spectacular presence both up close and from a distance. Seventeen gleaming aluminum spires reflect the sun and the sky, shining panels of stained glass cast a purple glow on the tile floor. Sound fills the space, creating a soul-stirring acoustic experience. 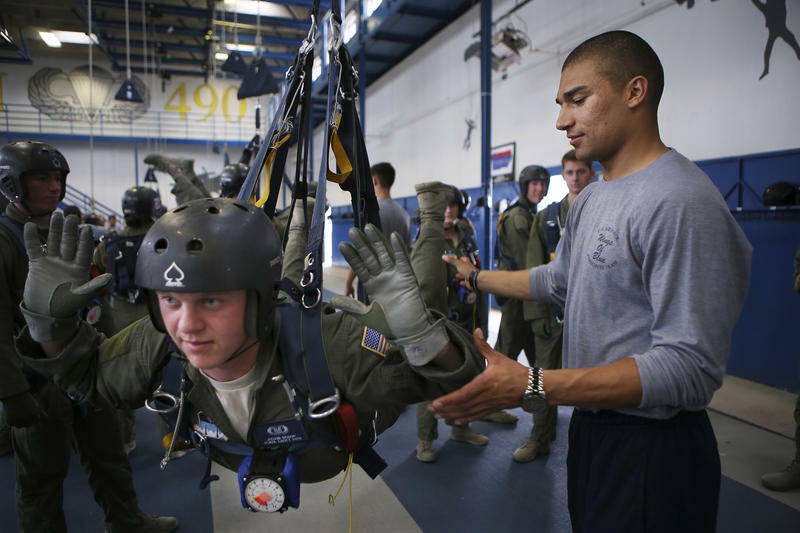 COLORADO SPRINGS, Colo. (AP) — A renovation of the Air Force Academy chapel has been canceled after funds were transferred to a Florida base. This story was reported for radio by Elissa Nadworny and for the web by Jon Marcus of the Hechinger Report. In her spotless camouflage uniform, Monica Callan stood apart from the dirty and exhausted-looking first-year cadets at the U.S. Air Force Academy who had just endured nearly three hours on the obstacle course.